Greetings owners of the Big Loo Robot. 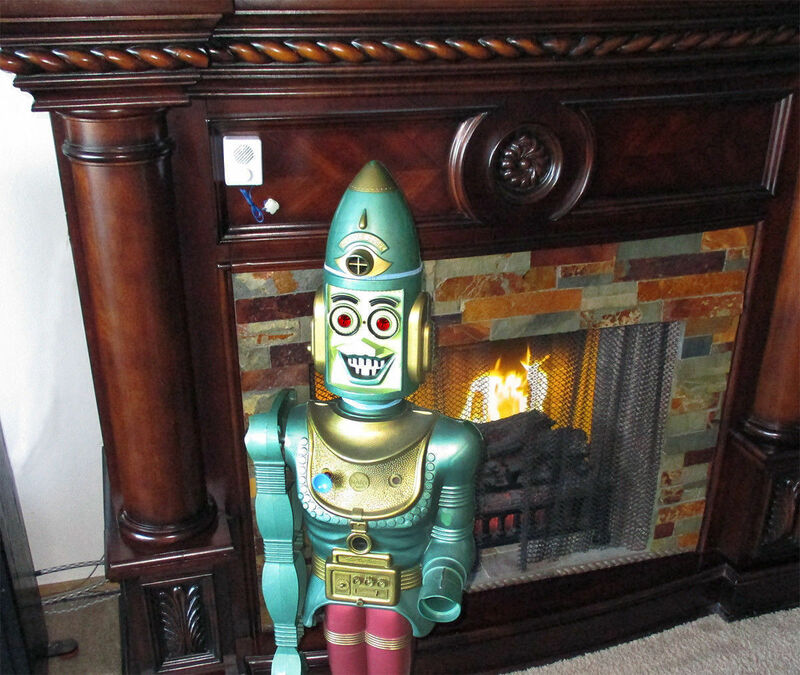 At our web site of BigLooRobot, we are constantly looking for ways to improve the Big Loo collector hobby and increase the enjoyment of this famous 1963 Marx Toy Company Robot. Our R&D team has recently developed a way to restore Big Loo’s voice to better than new condition. And did we mention that it is a quick & easy 60 second fix? Due to the fact that he is now over 50 years old, most surviving Robots have stopped talking due to broken hand crank knobs or punctured speaker cones. And those few Robots that do still talk often have a very weak voice. Heck, even when the Robots were brand new in 1963, the voices was never that loud. Then there’s the problem of cranking the internal record at just the right speed to try and understand what he is saying! Lastly, most owners have never heard him speak all 10 phrases because of the random nature of how Marx designed their voice playback mechanism. The instructions say to rotate the crank backwards, 1/10th to 1 turn to select another track. But in reality, all that does is lift the needle up, which is on a spring and when it drops back down, it might land on a different track and it might not. You might have to try that 100 times or more to play all 10 phrases. Whew! We took a circuit board with a voice ROM chip on it and made a crystal clear recording. To achieve that goal, we disassembled a Robot head and removed the record platter. We then cleaned all the tracks and reconditioned the playback needle. 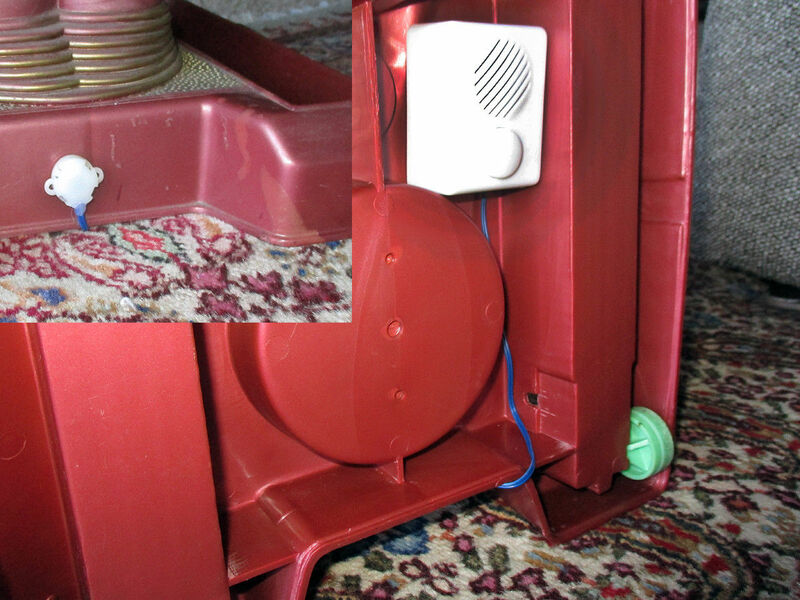 After reassembling the playback mechanism but with the head still apart, we setup a high quality microphone directly in front of the speaker cone and rotated the crank while recording. And just like the kids in 1963, we had to crank over and over again to get just the right speed and a good spoken phrase. We know it takes hundreds of attempts to change tracks and get all 10 phrases because that’s what we had to do. The end result was a high quality digitally mastered recording. The audio difference between listening to the intact Robot “before” and the digitally mastered recording “after” was significant. In terms of volume, the increase was amazing! 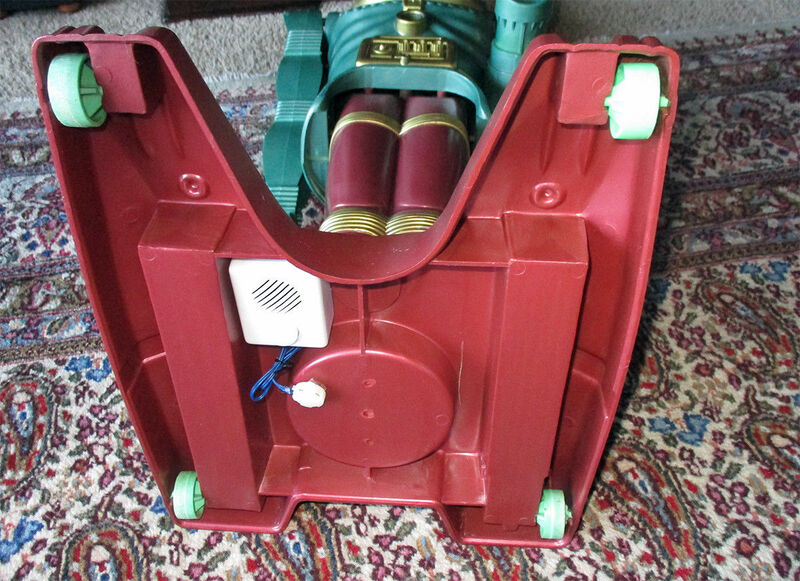 To use our “Big Loo Talks Again” module, you simply place the small 2″ X 2.5″ plastic box under the Big Loo’s rolling base platform. Use double sided tape (not provided) in case you ever want to remove it. It stays completely out of view. A small ten inch long tethered wire allows you to place the 1.5″ wide Start/Stop button anywhere you want. This is what you will press to activate the voice when you want to hear it. As an option and If you so choose to get really really creative with hiding the button, you can actually pop off the small plastic button cover with a small screwdriver and reveal the super tiny micro switch. Because it is only 1/2″ wide, there are a multitude of places you could hide it. We like the switch at the rear of the rolling platform as it’s easy to get to and very unobtrusive. However, a easy great hidden location is under the yellow Rocket Launcher. Just thread the tethered button through the Rocket Launchers side mounting holes (you would have to cut and splice the wire back together with some tape). Or you can just place the button underneath and directly next to the “Big Loo Talks Again” module for everything to be completely out of view. If you prefer not to simulate the sound coming from the Robot itself and want to just place it on the wall next to your Robot display, that would certainly be an option. The choice is yours. This playback module is small but boy, is it loud! When mounted under the rolling platform, the sound will bounce off the surface your Robot is standing on. Carpet helps to reduce the volume and it will still be loud enough to fill a room. 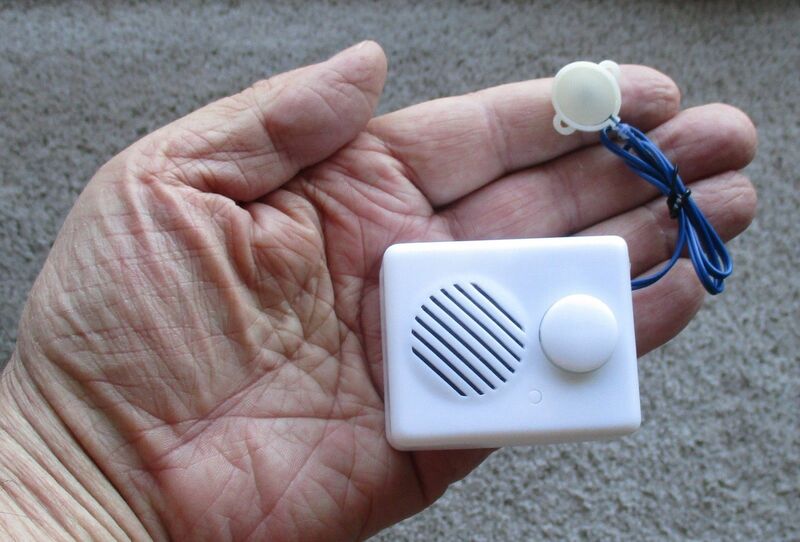 Tile or wood surfaces make the voice extremely loud and can be heard from 20 feet or more. Instead of straining to hear Big Loo talk, you will be using various techniques to make him less loud. There is no volume control on the module itself. We have placed a short pause between each phrase before he speaks the next one. Those will play through twice just in case your guests are so amused by your newly talking Robot, that they want to hear them again. At the end of the phrases, we have recorded the 1963 TV commercial. Which is a lot of fun because the announcer rings the Robot’s bell, toots his whistle and goes through all of Big Loo’s features. This is the same commercial you can play on YouTube. It you choose not to play the commercial, just tap the button to shut it off and then tap again to start the spoken phrases anew. It’s all just plain good old fun! The total length of digitally mastered recording is 2 minutes playing 10 original phrases, then one repeat of the 10 phrases and finally, the hilarious audio from the 1963 commercial. At the end of the recording, the module will automatically stop playing. Although the “Big Loo Talks Again” module does an excellent job of playing Big Loos phrases, they still originated from the crudely made 1963 Marx Toy Company playback record. They are indeed much better sounding than any Big Loo you will ever come across. When the commercial plays, it sounds just about as perfect as it did when watching it on TV. If you have ever heard spoken phrases from your Robot, you will agree that this is an excellent improvement in clarity and a gigantic difference in volume. However, if this is your very first time hearing Big Loo speak, you may be somewhat disappointed at how primitive the voice sounds. But this was the Marx Toy Company’s playback solution in 1963. We include simple operating instructions and the complete list of the spoken phrases and in the order that they are played. The Big Loo Talks Again” module is powered by 3 AAA batteries (not included). There is an On/Off switch on the module that can conserve power in the situation where your Robot will be sitting for months without use. You should get 300 to 500 plays on a set of batteries but obviously if left switched on for extended periods of time, it will eventually drain the batteries. The recording itself cannot be erased even if the batteries are removed. You really can’t hurt this thing and other than occasional batteries, it should last you a very, very long time.